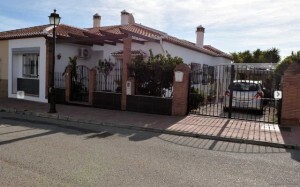 REDUCED TO 175,000€ for a quick sale: Villa Las Yucas is semi detached and located right in the heart of Puente Don Manuel, within easy walking distance to all the shops, restaurants and bars. Although very central, it still has lots of privacy and a great view of Mount Maroma. Very secure, it has a gated entrance to the front terrace with pergola and also gates to the car parking area, with car port. The garden is easy to maintain with mature Yucas and orange trees, it is completely fenced and walled and there is a 6 x 3 pool with lots of privacy. Off the pool and terrace area there are patio doors that lead in to the large open plan lounge, kitchen, dining area. The kitchen is modern with a feature extractor and white units. The lounge/ diner has a newly serviced AC unit for hot and cold air. Just off the lounge is the master bedroom with fitted wardrobe and ensuite bathroom. The second bedroom is a good size double and has use of the general shower room. The third bedroom is a good size and is currently being used as an office and the fourth bedroom is very large and has been converted from a clothes shop into a guest room with new air con unit. This property formerly utilised the 3rd bedroom and 4th Bedroom as a Dress and Clothes shop and would easily convert back to it´s commercial use if a local business income is required.